Originally developed in Europe, Gordon’s were known as Black and Tan setters. It’s believed they were brought to this country in the mid 1800’s, by Daniel Webster, long before many of the now popular breeds. They were the best ruffed grouse and woodcock dogs around. 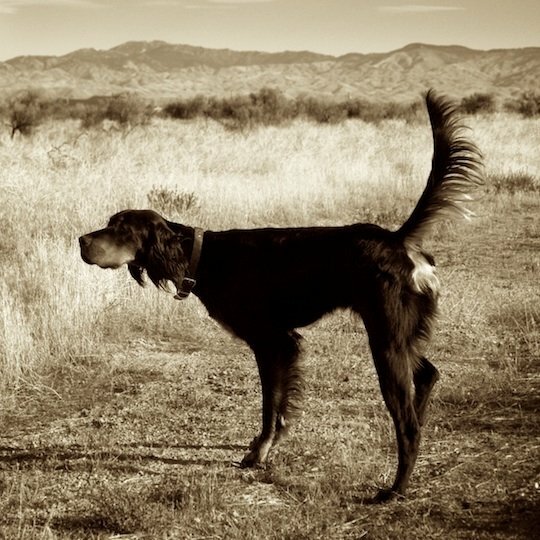 A Gordon Setter named “Knight” won at the first ever field trial in 1874. Gordon Setters are stylish, rather racy built, medium sized, muscular dogs, and symmetrical conformation throughout. They should have a strong fairly short back and a short tail, a fine head, intelligent expression, clear colors and a straight or slightly waved coat. Coloring is mostly black with light or dark tan markings on the muzzle, eyebrows, lower legs and feet. Sometimes a little white on the chest is evident. Shoulder height should be between 22″ to 25″ for males and females will be 21″ to 24. Gordon’s are said to have the brains, bird desire, beauty and a connection with their owners that set this breed apart from others. They are excellent hunting dogs, companions, and calm family pets. Gordon’s are said to be aloof towards strangers and loyal almost to a fault to the person of their choosing, a one-person dog. They do not do well locked in a kennel all day and night. These dogs need contact with their owners, to lie at your feet (or on the couch) and play with your family, always waiting to go on the next adventure. They are a working breed and live to hunt. I have never seen my dogs happier than when they are in the field doing what they’ve been bred to do. We are a small breeder striving to produce dogs that you would be proud to own. At this time we produce about one litter of puppies a year. Our objective is to produce early starting, good looking, biddable, intense and companion / gundogs with lots of point. These dogs will work out to 75 yards in thick cover and out to approx 350 yards in thin cover. 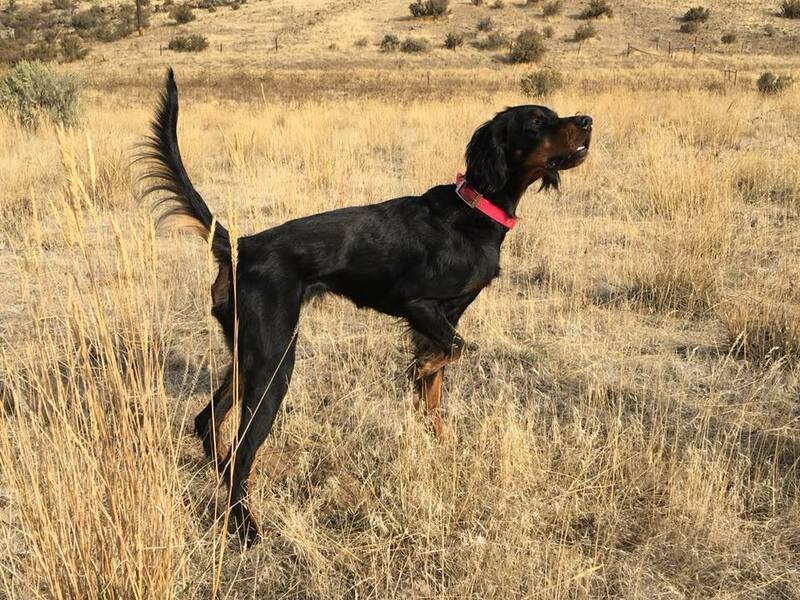 These are working lines of setters that are being hunted on Prairie Grouse, Woodland Grouse, Chukar, Huns, Valley Quail, and when traveling, Pheasant and Woodcock. We test our dogs in AKC Hunt Tests and occasionally participate in AKC Field Trials. We also ensure we are breeding healthy and happy dogs by having our dogs tested for genetic problems. Puppies are raised using the “Super Puppy Program” as developed by the military. Bettering the breed is ultimately our goal. Kelly and I have lived in Boise ID since the summer of 2007. Kelly is a Chaplain at St Luke’s hospital. This is something that she’s always wanted to do. I’m retired Air Force and currently working for the Veterans Hospital in Boise. We have a young daughter. Our dogs live in the house with us and are trusted around our little one. We love the outdoors – hiking, biking, camping, hunting and fishing are some of our favorite past-times. Most of all I love to bird hunt with my dogs. I hunt on average of once a week. Watching them run and do what they’ve been bred to do is poetry in motion. I’m an active member in the local pointing dog club (The GSP Club of Idaho) and participate in AKC events. Pete, born Oct 2008. 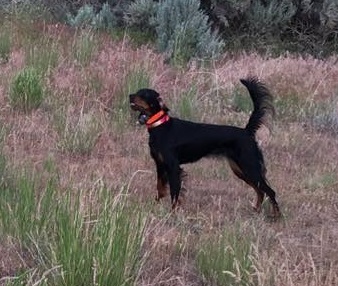 He has lots of point, started early and at a year old he was pointing pheasant, sharptails, chukar, huns and quail. He has an excellent nose and instinctively points his birds from a long distance. He is an excellent Hungarian Partridge and Chukar dog, he’s especially good at finding and pointing Huns in this big country. Pete’s naturally staunch enough to allow me to walk in front and flush. He has a natural back, stands approx. 25” at the shoulder, weighs approx. 57 – 60 lbs, tight feet and eyes with a nice high head and tail set on point, a very stylish dog. Currently he hunts at a range of 300 to 500 yards and sometimes further depending on cover and bird density. This country is big and open, I need a dog to stretch out and find birds. He’s a natural, I’m blessed to own him. Dot, born Nov 2013. Dot has lots of desire and style. She’s has an excellent nose and is very animated in the field. She stands approx. 23″ tall at the shoulder and weighs about 40 lbs. 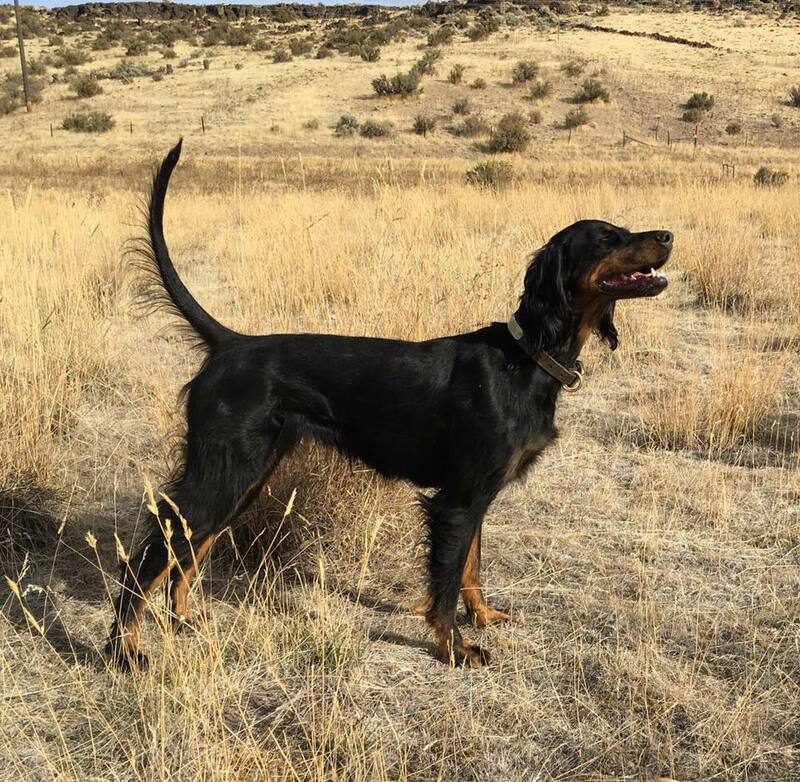 She has a nice short field coat, which will require less maintenance, tight feet and eyes with a nice high head and tail set on point, a very stylish dog. Currently she hunts at a medium range, out to 250 yards in thin cover. Tallgrass Red Dot, OFA "Excellent"
Whelped Mar 2016. Zoli is a good house dog with plenty of desire and style. She’s has an excellent nose, pointing her birds from a good distance and is very animated and quick in the field. She stands approx. 22″ tall at the shoulder and weighs approx.38 lbs. She has a nice short field coat, which requires less maintenance, tight feet and eyes with a exceptionally stylish point. She hunts at an unadjusted medium range, out to 350 + yards in thin cover. She has been DNA checked to see if she’s a CCA carrier and has been found to be negative. She’s a fun dog to hunt behind, quick on her feet and attentive to my location. She has been VERY easy to train to be steady to wing and shot. Mar 2017 – GSP Club Test – Mayfield Idaho – Received qualifying score in Junior Hunt Test. Tallgrass Pistol Pete, OFA "Good"